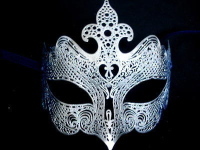 A Stunning and extravagantly designed Phantom Venetian filigree mask for a man or woman. A great accessory for injecting a touch of vintage-inspired style, this gorgeous Deluxe Phantom Filigree Masquerade Mask - Nero Black is tipped to be the hottest trend this season. Elegant and timeless, this stunning filigree mask is great for flaunting your romantic side, and is embellished with glittering Swarovski Crystals to create a sparkling allure. 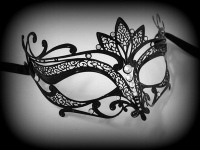 Excitingly different by having an asymmetric style of scrolling decoration, fabulous in nero black metal this mask is exquisitely decorated by hand in Venice & creates a classic style when worn to balls or parties to show off your free-spirited sense of style. 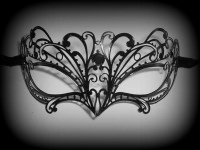 This is a light and comfortable masquerade mask to wear which ties with satin ribbons. For a man or a women who wants to stand out from the rest.